"Frankenstorm" has hit the eastern seaboard. It is the clash of Hurricane Sandy and a couple of northern lake effect storms. At Snowshoe Ski Resort they got 23 inches of snow. And no, that isn't a typo, 23 inches. 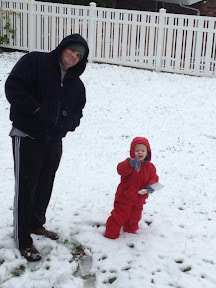 Here in Huntington we only got about an inch, but it was enough that Tristan was raring to go out and play. It's the first time he's really been out to play in the snow. Last year was so warm we barely got any and I can't remember why we didn't go out the year before, but today he was obsessed. He asked me every 20 minutes or so until he finally got to go. I made him wait because Scarlett was asleep in his room and I didn't want to wake her up getting his snow clothes together. I was kind of bummed I didn't get to out, but Scarlett wanted to eat and Tristan couldn't wait another second. So, his daddy took him out. I checked on them a few times and took pictures. Never once in the hour they were outside did Tristan complain about the cold! 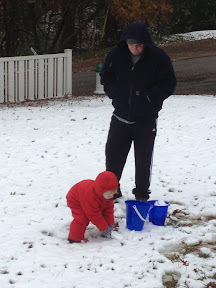 He dug in the snow and sang "Diggin' a hole lookin' for a robot," just like the Man in the Yellow Hat as he digs a hole in the sand on Curious George. 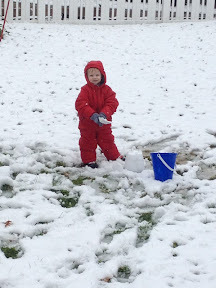 The snow was SUPER wet so they made a castle with Tristan's bucket. I am normally 100% anti-winter, but I can't wait to take Tristan out the next time!